My favorite time to be out in the garden is during, or right after, a rain … but if I can’t have that I’ll gladly take overcast. What I love about these conditions is the quality of light they produce … a light that intensifies the colors of my plants, particularly my succulents. 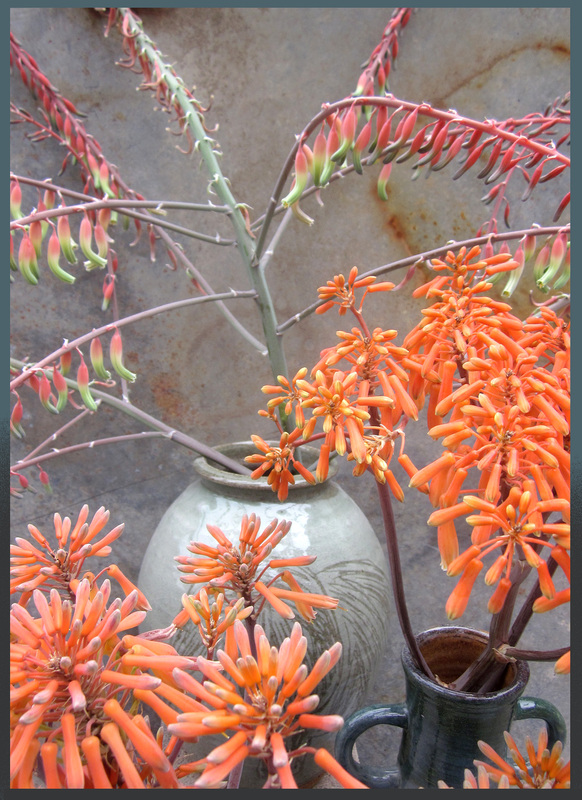 The unique blue tones of senecio are cooler-bluer, the darkness of aeoniums deeper-denser, and the orange-salmon of my aloe blossoms positively incendiary. Today was overcast, even drizzly, and I loved it. I wanted to record my colorful plants’ hues before the sun muscled its way out of the cloud cover. Please to enjoy! Spring’s aloe color show is in full swing, and every variety is shooting up sparks. With the exception of a yellow variety that’s shed its blossoms already, the red-orange-salmon-hot pink tubular blooms are visible from a block away. 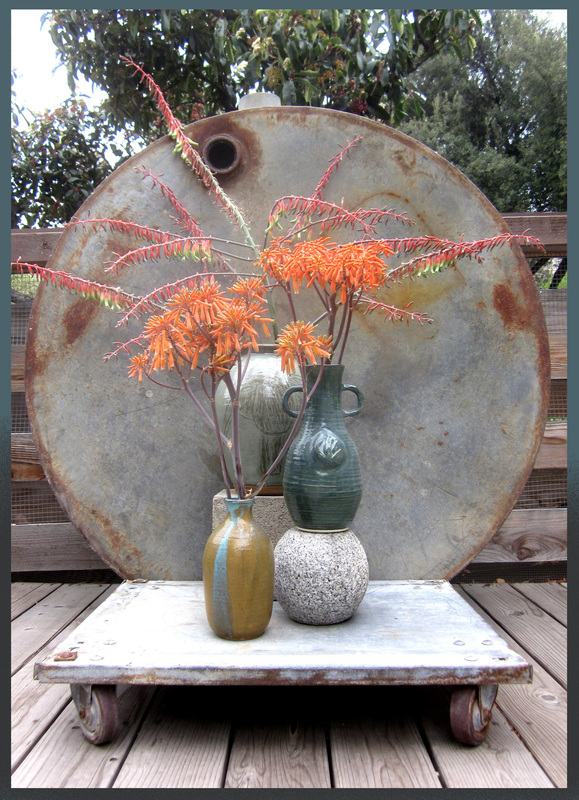 I’m recording these aloe fireworks against a neutral backdrop: the gray of our wooden deck, a favorite old metal dolly and the circular underside of a big ol’ metal water tank. 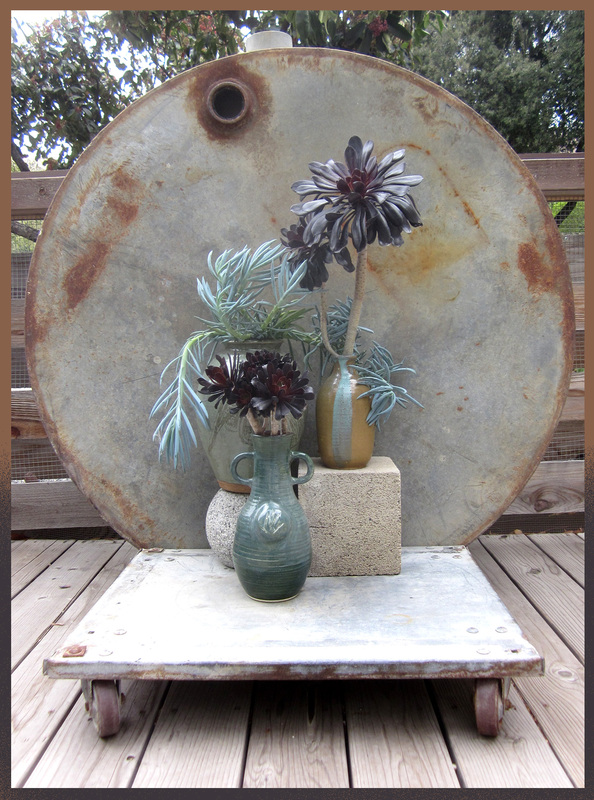 The pottery’s neutral too, a collection of flea market pieces in subtle blue-green tones. The cool, blue fingers of a senecio in need of a trim, and two types of black aeonium — one with huge flower petal rosettes and one with smaller, tighter versions — nuzzle up to each other. 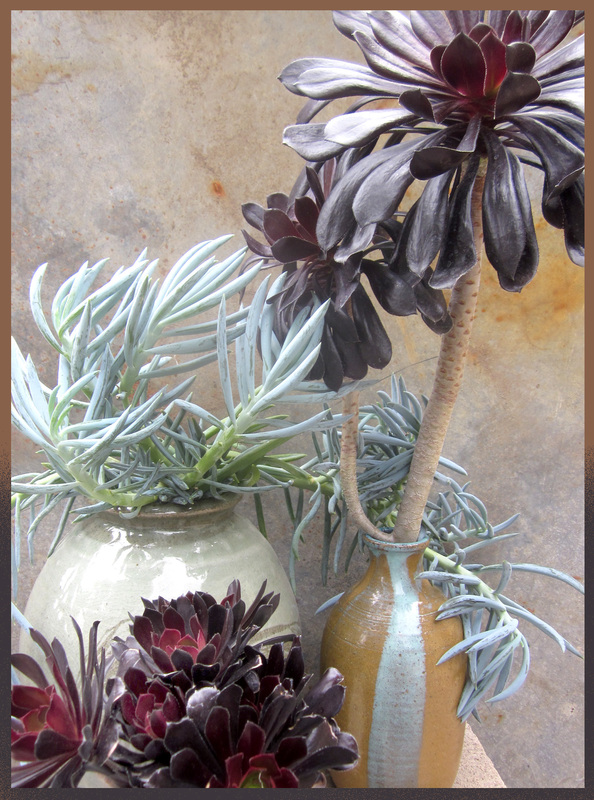 There’s contrast galore here: the succulents contrast against each other in both color and texture, and their foliage types couldn’t be more different … Add in the background and the pottery and the color story is pretty dramatic. Overcast gloomy? Just the opposite: it’s puts everything in my garden in a better light. LOVE IT!! You are amazingly talented. Thanks, Guida … how’s things in your Santa Ana garden? Steady rain all day here in Norcal, cold and blustery.When the sun came out for about 20 minutes between storms, everything was shiny-bright. I know what you mean about the overcast..I look forward to June gloom. Your tank vignette is splendid ! Thanks, DD … I love June Gloom, too! High praise coming from PFS — Amazing stuff on your blog! [blush] Thank you very much. Very much enjoy your photos and design! What artful displays of your succulents, Reuben! The effect with the backdrop is very oriental. Beautiful! Not bad for junk, right? But what better way to set off these blooms against our favorite rusty pieces? You do tickle and treat my eyes to such wonders.. Thank you….